The statistical odds of someone in Falkirk having acquired an illegally-traded puppy this Christmas are high - and so are the chances of that animal being very ill. The SSPCA did everything possible to raise awareness of the problem in the run-up to Christmas, most recently spelling out its message to Falkirk East MSP Angus MacDonald. He paid a visit to the charity’s centre in Alloa, and learned first hand the harrowing facts behind a cruel and cynical trade that cashes in on the gullibility of people who only want to believe the best. A veterinary nurse from Falkirk, who asked not to be named, says too many people are prepared to turn a blind eye to the facts when searching for their ideal pet. Supposed health accreditation may look legit, she says, but on inspection it can turn out to be, for example, an affidavit that the animal is certified clear of rabies in Hungary - but which says nothing about UK health checks. Pets should be microchipped from eight weeks - many aren’t - and ideally the pet’s mother should be present when there’s the prospect of a purchase. 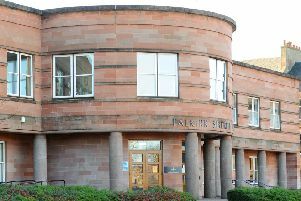 Meanwhile, although it’s a problem across the country, a cursory look at online news articles over past years reveals a disturbing catalogue of court cases in and around Falkirk and Stirlingshire. These are just the people who - after keeping animals for breeding purposes in disgusting conditions - were caught and brought to justice. Beyond that it’s known that one of the most notorious sources of ‘farmed’ puppies is Ireland, where unscrupulous traders can rely on steady business in Scotland, a short ferry trip away. Thousands of puppies are claimed to be moved through the port of Cairnryan every year. The fact that regular seizures are made en route merely underlines the scale of the problem, and to a criminal the profits to be made from gullible buyers make the risk of detection seem worthwhile. Christmas can be the worst time of the year for people who actually care about animals, because on top of the activities of illegal traders there are the many who buy a dog quite legally, only to discard it like a broken toy a few months later. The SSPCA, which is set to continue its forceful lobbying of politicians next year, frequently has to pick up the pieces - and needs public support in its bid to bring about change. On Wednesday, a parliamentary debate at Holyrood saw dog lovers being urged to adopt an animal from a registered charity or shelter instead of purchasing a puppy. “The illegal puppy trade is an abhorrent practice that has no regard for the welfare of the animals involved.